Khonsu is the Ancient Egyptian God of the Moon, a young God with the sidelock of hair indicating youth, he is the traveler and marker of time. Along with Thoth, Khonsu was the Keeper of Time whose name means "The Traveler" reflecting the moons journey across the sky. He was said to watch over those who traveled at night and was invoked to protect against wild animals and aid with healing. One myth says hat when Khonsu caused the crescent moon to shine, women conceived, cattle became fertile, and all nostrils and every throat was filled with fresh air. 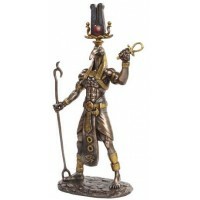 One of the harder to find Gods as a statue, we are happy to present this stunning bronze resin statue standing 11 inches tall. He holds the Was staff of creation along with the Crook and Flail of divine power and kingship. Accented with hand painted color detail. Item Number: UI-WU77193A4 | Approximate Size (Inches): 4.00 wide x 3.50 deep x 11.00 high | Approximate Shipping Weight: 3.00 lbs.